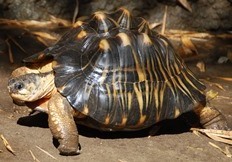 These tortoises are only found on the island of Madagascar. Unique star-shaped patterns on their shell with yellow centers and lines running from the center to the periphery have made these one of the most beautiful tortoises of the world. Males have a longer, more distinct tails than females. Females produce three clutches of eggs during the breeding season laying up to 5 eggs per clutch. These eggs are incubated for approximately 6 to 8 months. Conservation: Major threats to wild populations of this species are habitat loss due to conversion of native habitat to agricultural land, livestock grazing and due to the collection of wood for domestic use. Individuals are also captured by humans for the pet-trade and for human consumption. This species is endemic to Madagascar, the island in black to the right of Africa.